The permanent solution to sun-faded bumpers and trim moldings. Forever Black restores a dark, black, finish on sun-faded bumpers, body moldings, rubber parts & more. This is not a cosmetic dressing. It's an easy-to-use permanent dye. It permanently dyes all textured black plastic, rubber and vinyl with the same polymers that the manufacturers use. It is not a silicone dressing - silicone products will make plastic, vinyl and rubber appear to have regained their color but the change is temporary. Additionally, silicone oils have been known to dry out the applied areas creating a bigger problem. Use this product on: Bumpers, Wheel Wells, Rubber Parts & Weatherstrip, Moldings, Mud Guards, Door Handles, Spoilers, Mirrors, Boat and RV Trim, Running Boards & MORE. Permanently recolors and protects all black plastic, vinyl & rubber surfaces on your car without silicone. Environmentally safe and dries in minutes. Water resistant and won't attract dust. Protects against UV damage. 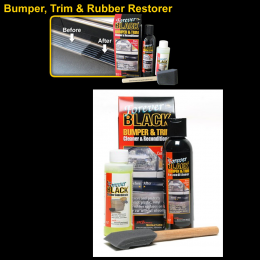 Forever BLACK™ Bumper & Trim Cleaner and Reconditioner has become America's #1 choice for restoring black bumpers & trim. Permanently recolor and protect all black plastic, vinyl & rubber surfaces on your car without silicone. We use the same chemicals that the manufacturers use. This product does not attract dust. Protects against U.V. damage.